It took a little while for me to remember what we ate this week. It’s come to the point where I’ve had to print and cut the October and November pages for my Filofax so that I can keep track of the daily nosh. One might suspect that I’ve become some sort of late-to-the-party foodie hipster, but my photos of food are a little more practical than that. Posting dinner is helping me to stay accountable for the food I put in my face. I’m working my way down from “big girl store sizes” to “normal clothing store sizes” — whatever those are these days. Since weight loss is about 90% diet, photographing my food helps me stay aware of the food I choose to eat. This week has been a little disorganized, as our meal planning fell by the wayside, and our Sunday shopping trip was skipped. Oops. We’ll be trying to make sure that doesn’t happen next week. Friday: The Husbeast loves seafood. 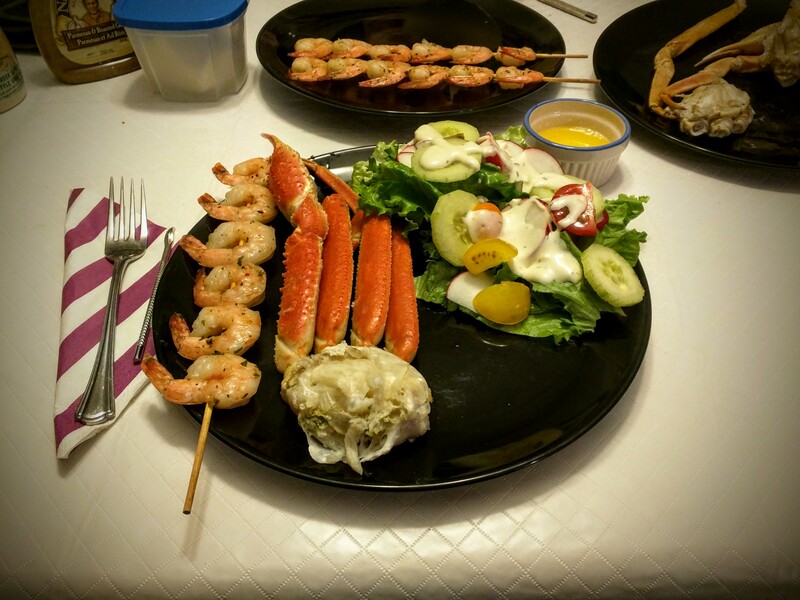 Rather than go to Red Lobster, we picked up some shrimp skewers and frozen crab at the Co-Op and made our own Seafood Feast. I’m still learning to enjoy the taste of seafood, but I’m warming up to the taste! 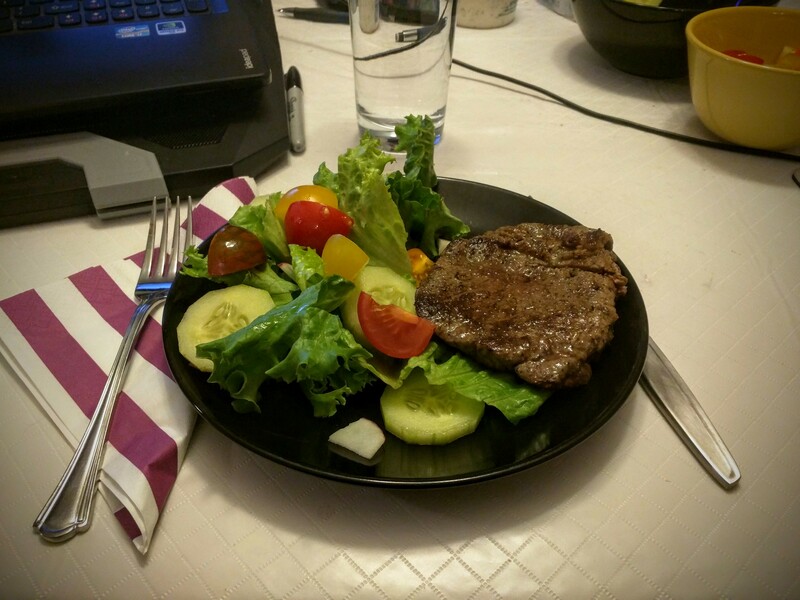 Saturday: Steak and Salad. Sometimes you just need a really plain, easy meal. There will likely be a lot of repetition of some meals as there are certain things on our go-to list. Sunday: No photo, sorry. We were caught flat-footed after an afternoon of running errands, so we hit up a couple of fast-food joints. We didn’t do too terribly badly, though. I had an A&W Teen Burger and a few bland onion rings. I think I left more food than I ate. The Husbeast indulged in a Burrito from Mucho Burrito that, ultimately, didn’t sit well with him. Dinner was topped off with small-sized Blizzards from Dairy Queen. It was a bit of a treat, but we enjoyed it — and exercised a bit of restraint in sizing! The small was actually Just Right. No need for the Large! Monday: Again, got lazy with the photos. Neither of us were feeling all that great from the dinner of the day before. I had spent Sunday night cleaning the pantry, so we popped open a can of soup that was still within its expiration limits, and when that proved to be less than filling, I scrambled up some eggs. Comfort food, yes, but also gentle on the tummy. 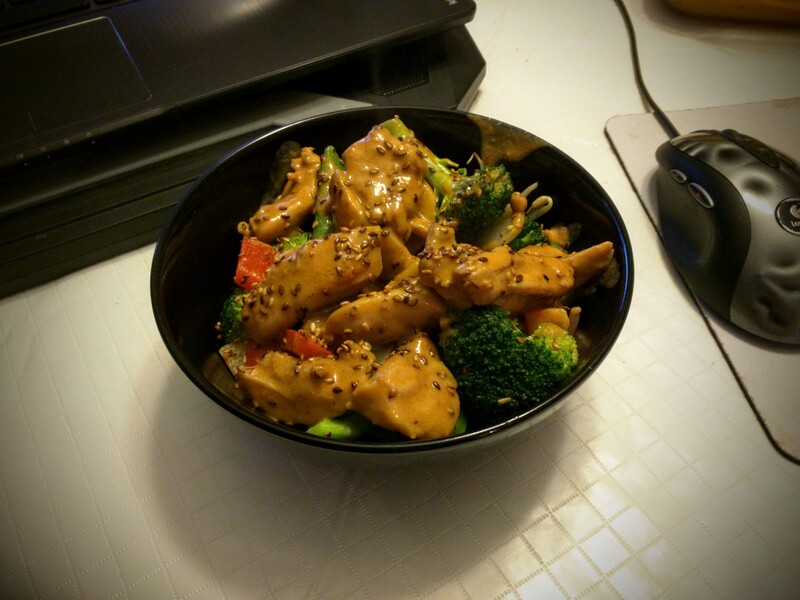 Tuesday: The Husbeast made a chicken stir-fry! We realized that we needed a couple of meals that would give us leftovers. Stir fry is one of the dinners that fits that bill. Tastier than it looks, honest! 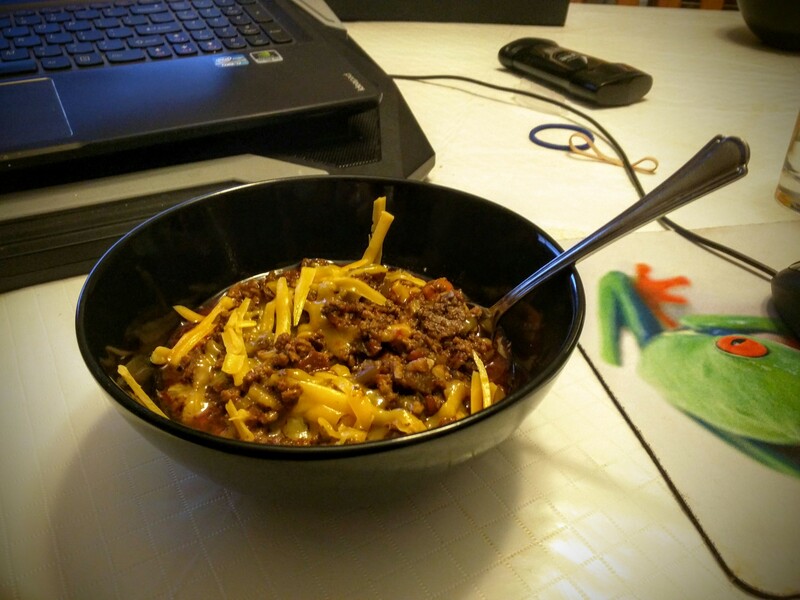 Wednesday: Chili. It’s a recipe that I found on a paleo recipe site, but as I’m not strictly paleo, I add cheese as a topping. If I’m anything, it’s general low-carb, but I’ll steal meals from other diets as long as they work within the general scheme of things. 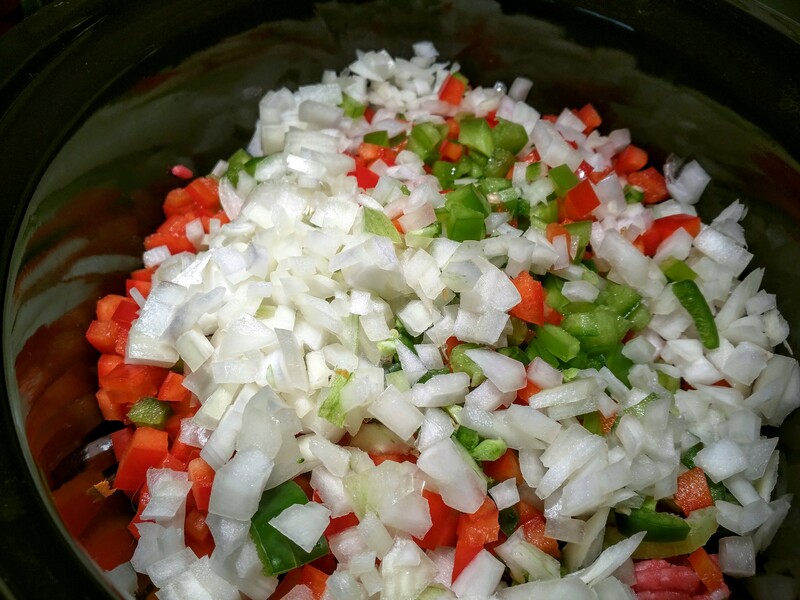 And with the amount of veggies in this chili, I think it qualifies as a go-to recipe. 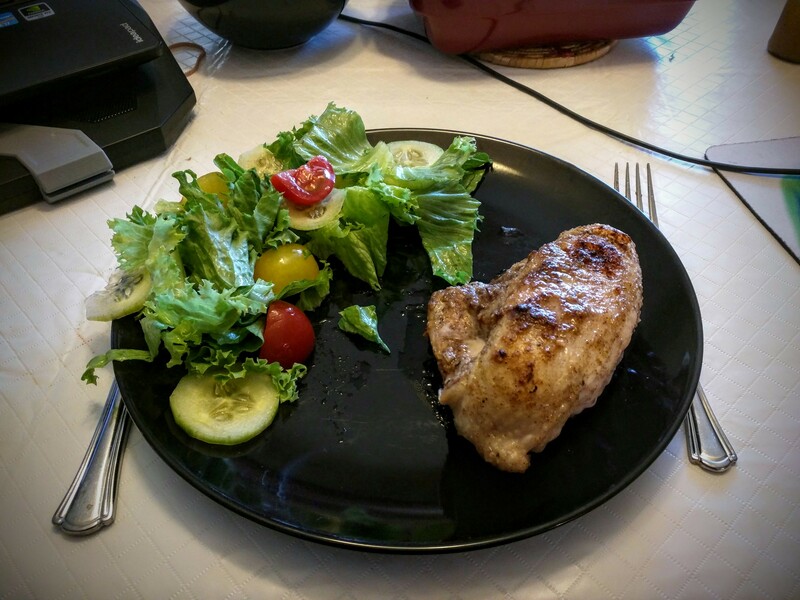 Thursday: Roast chicken breast and a salad. Again, a staple meal. I’ve come to prefer chicken breasts that are still on the bone with the skin attached. Why? Because you season the skin and it keeps the chicken moist. The one thing I don’t like about boneless, skinless chicken breasts is how dry and tasteless they become. The only drawback is that with the past thirty years of fat phobia in regards to food, it’s become a bit more challenging to find cuts of meat that don’t dry out in the oven. And that’s it! Next week’s goals are to stay on plan, do the weekly shop, and attempt 100% photographic evidence. 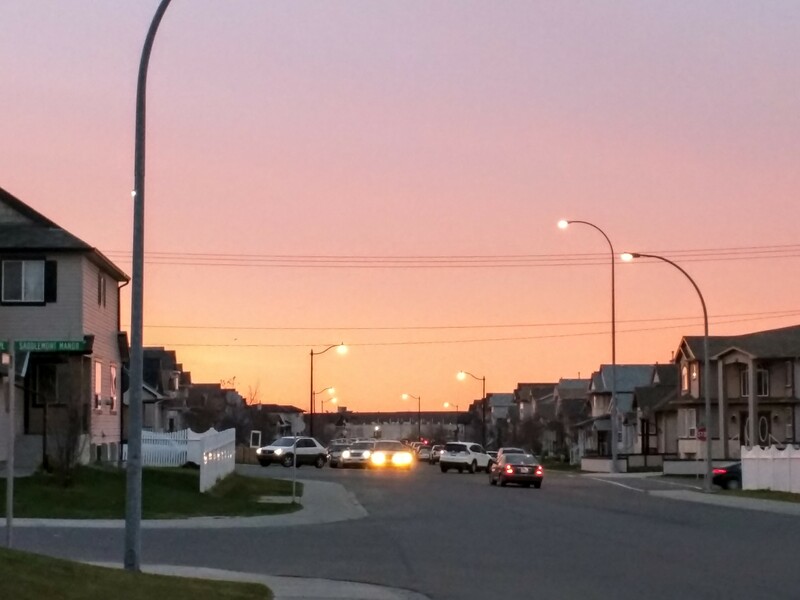 I caught a beautiful sunrise this morning and figured I’d share it with you.